The mission of the group is to provide an overall campus involvement experience for elite leaders engaged in the university. 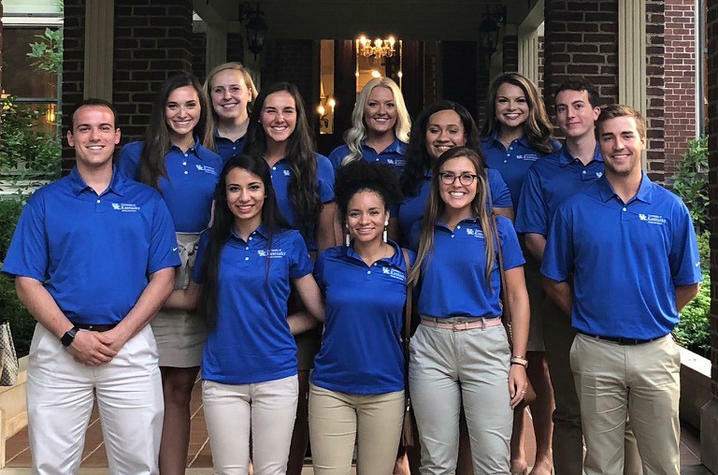 This program is a partnership with the Office of the President and the UK Alumni Association to showcase the best and the brightest of UK’s students. These students have demonstrated high achievement in their collegiate careers and dedication to the betterment of the university. Ambassadors are required to maintain a 3.0 GPA or higher and have various backgrounds, cultures and areas of campus involvement. The Alumni Ambassadors are available by request to work university functions and events. Requests must be submitted two to three weeks in advance of the event and approved by UK Alumni Association staff. For more information on the Alumni Ambassadors and requesting an ambassador for an event, go to www.ukalumni.net/alumniambassadors. The UK Alumni Association is a membership-supported organization committed to fostering lifelong engagement among alumni, friends, the association and the university. For more information about the UK Alumni Association or to become a member, visit www.ukalumni.net or call 1-800-269-2586.